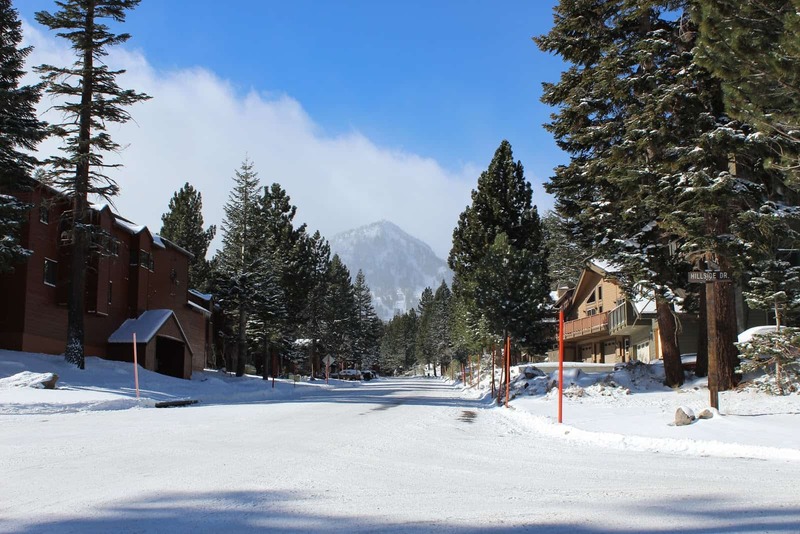 We PRAY for snow in the ski town of Mammoth Mountain, California. And OH HAPPY DAY! It snowed yesterday! HIGH FIVE!!! My cousin, without power in New Jersey, doesn’t exactly feel the same way about snow right now. I LOVE that girl…she is so positive. She’s been saying that at least they have heat and hot water and she wears her husband’s flash light hat around the house at night (so I have a mental image of her with no make-up, hairdryer-less hair, flash light on her head and a big smile). Below is the view from our living room. Such a pretty day, I think I will take Rocky for a walk. Don’t worry, we aren’t about to be attacked by the mama bear…it’s an iron sculpture in the village. At the end of the road, you can see part of the ski area. apparently it is also a nice place for a nap. 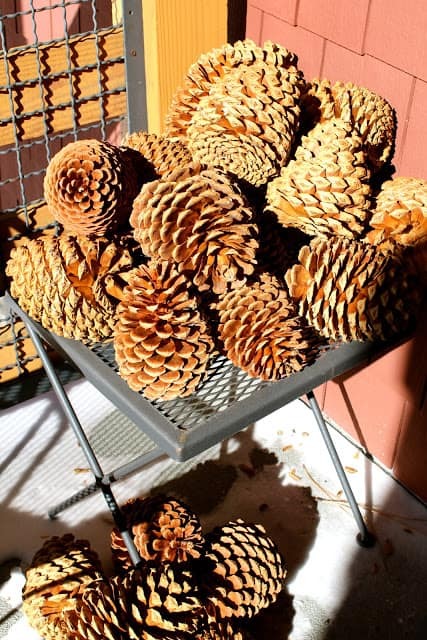 I have been picking up giant pine cones on my walks with Rocky and stashing them on the balcony…got any great ideas that I could do with them? 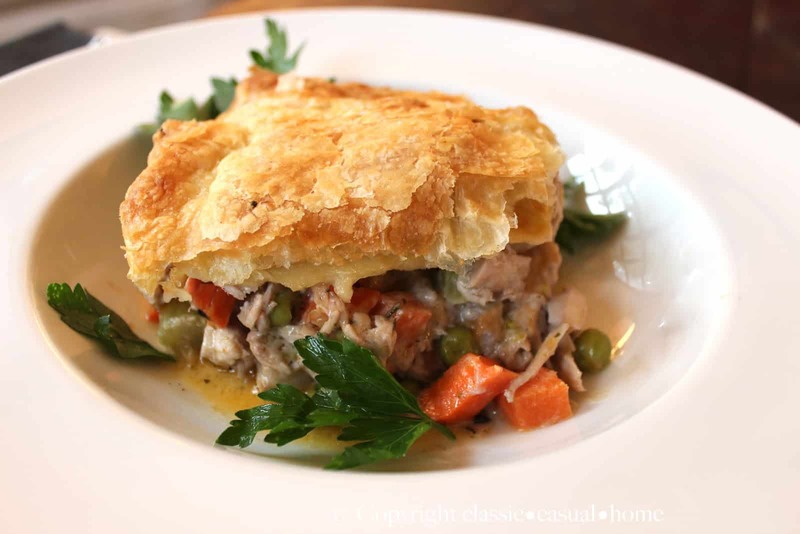 This is good weather for Chicken Pot Pie with Puff Pastry Crust. It made our whole ski condo smell FABULOUS. The parsley is on there to make you think it’s healthy…I do that a lot…use parsley. I switched the recipe by baking it in an 8 x 8″ Pyrex dish (instead of individual ramekins)…and replaced of all those seasonings, with two tablespoons of Herbes de Provence and about five dashes of Frank’s Hot Sauce…you could use any hot sauce…that is my secret ingredient. The chicken was already roasted from the grocery store and I shredded it. Pretty easy. 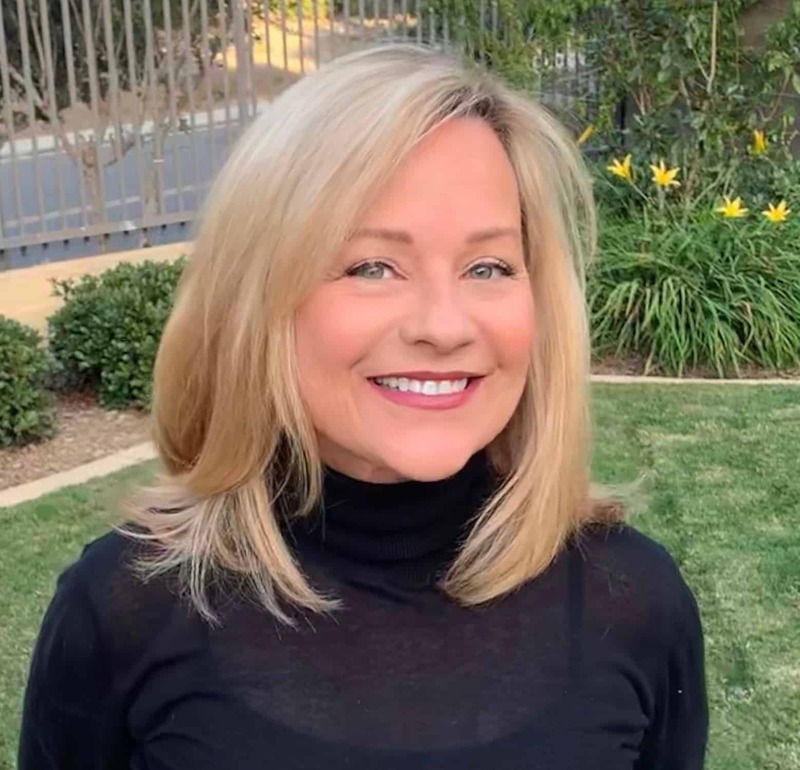 Terri from La Dolfina was just in southern California. She and her husband and I did the beach stair walk together. Terri is just as genuine and adorable in person as she comes across in her blog. She is a true hunter of treasures. but I did not have time grab it before coming to Mammoth. Terri also found this stone topped console table for just $98. She has a good eye! PS. My cousin just texted that their power is back on!!! Oh man!! I want that table!!! Gorgeous!!! Love your little place in the mountains! You are blessed my dear friend!!! Mary Ann I know you are having a wonderful time at you amazing home and setting in the mountains!! So glad you got together with Terri. I adore her. She is very special, very kind. Your place is beautiful! 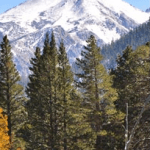 I love Mammoth and love your pictures of it. What an awesome place you have! SNOW-yea! Chicken pot pie-yum! Chandelier-score! Every time you post about Mammoth.. I miss it so 🙁 I learned how to ski there AND celebrated my 21 birthday thirty plus years ago. When I had my kids, we had a condo and would go regularly. Such a fun spot and great for skiing! Your recipe looks SO delicious. I need to make this for dinner! Love the pictures, especially the bear statue. 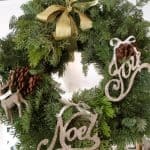 You asked what to do with your beautiful pine cones…go to http://sweetsomethingdesign.blogspot.com/2012/11/new-christmas-wreaths.html and scroll through her wreaths till you see what she made with two huge pinecones. Enjoy! Oh, I miss Mammoth. New Jersey is not that fun this year. It really is beautiful there! So nice to have snow this early in the season! But here in New Jersey I am happy just to have my power back! We got ours back yesterday – which was day 12! I hope your cousin is next! She got it back this afternoon… sorry for your hardship. There's nothing like a fresh snowfall. And a nap. Love that table….for $98!!!! Amazing. I have to smile at your cousin's headlamp we just spent a week wearing them too and they're very useful glad she has electricity back. Your pot pie looks incrediable and I'm going to try mine next time with a roasted chicken from the store. I hope you're having a wonderful time Mary Ann it's beautiful! Great pics and the lobby looks a great place to snooze,have 2 ski centres local to me but not quite as much snow as you yet. Loving the big pine cones too. The snow looks beautiful! I must try that chicken pot pie, looks yummy!!! 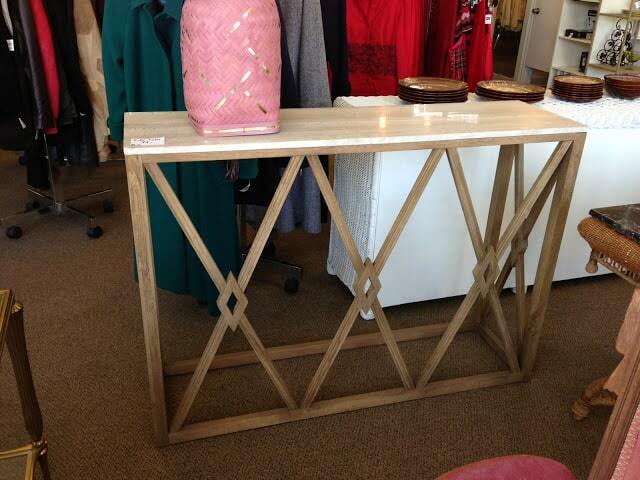 Oh, and that thrift store console table…what a bargain!! Hope you are having fun. Gorgeous pics of the snow… our new neighbor next door just moved back to San Diego from Mammoth. That chandelier is so beautiful! 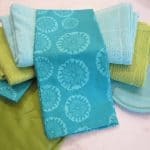 Terri does find the coolest stuff… do you happen to know the name of the thrift store? I do get up to the Newport area on occasion and would love to check it out! 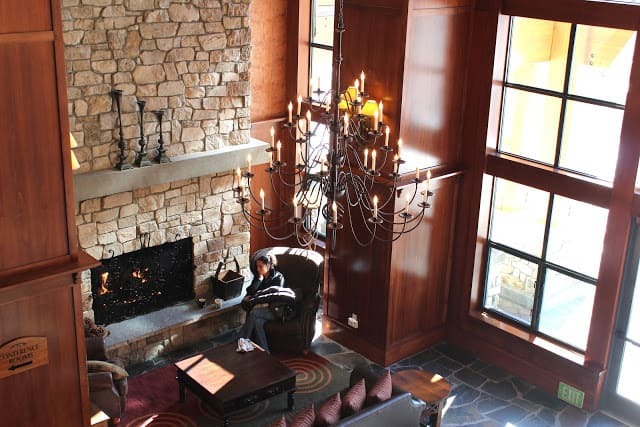 Your ski place looks so cozy!! I love it…..the scenery and view are stunning! No wonder you love going there…you are welcome to have the snow we have gotten, way too early for me. LOVE chicken pot pie more than words can convey, its my absolute favorite comfort food. So you mean if I put a sprig of parsley next to it, its immediately half the calories? I like how you roll, Mary Ann! BTW Love your new header *assuming its new or I just had my head elsewhere and didn't notice??? Looks great! You are so lucky to be able to enjoy the beach and the mountains! 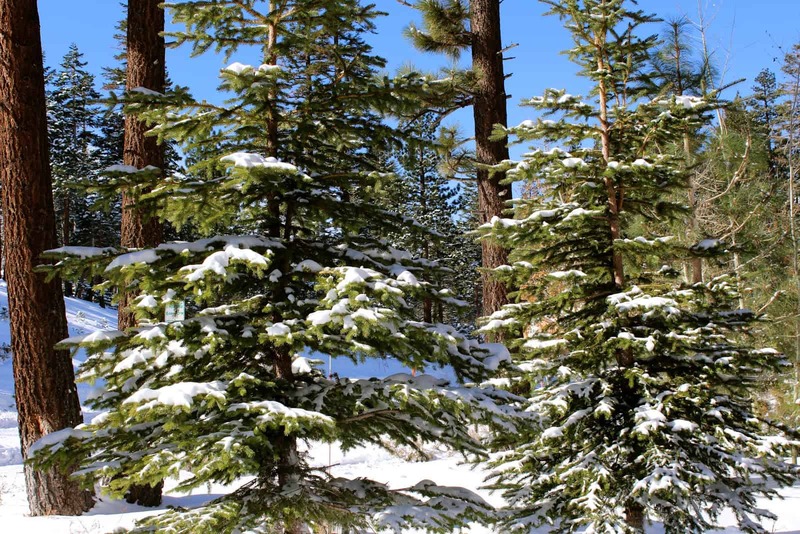 Your snowy surroundings look beautiful! Glad to hear your cousin's power has been restored. Enjoy the rest of your weekend! Looks amazing. Would love to be there today having that chicken dish! Beautiful ski house. My husband and his brother just went halves on a ski house season rental (they are both avid skiers) I like sitting inside with hot chocolate and reading material, but have to say watching the snow is so beautiful. mammoth looks beautiful! i've never been though i've been in la for a few years now. maybe this year! as for the pine cones you could spray paint them gold or silver and put them in a bowl as a thanksgiving centerpiece? Oh my that coral chandelier! What I'd do for that beauty. Your photos are beautiful, nothing prettier than blue sky and white snow. I just loved this post. It reads like you are so relaxed and enjoying your time in the mountains. Wishing I had a little bit of this right here before the holiday craziness begins! Also, the pie looks like a gormet meal! yum. 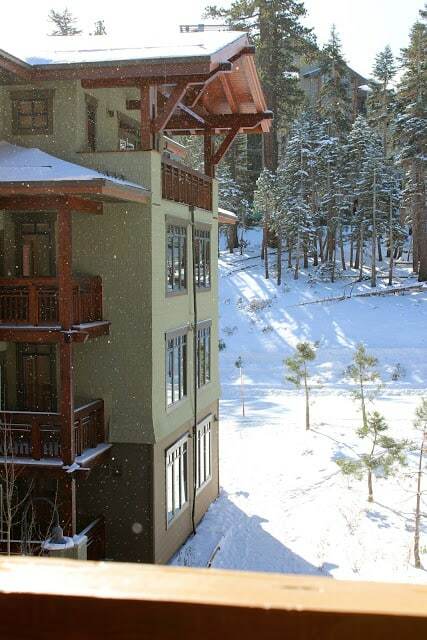 M.
Your view is magnificent…makes me miss Colorado and skiing everyday. Walking through that lobby everyday must make you feel like you are on vacation everyday! 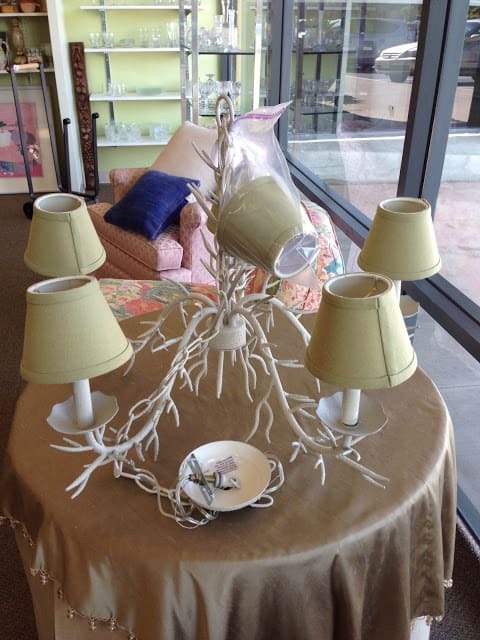 That chandelier for Alie is going to be fantastic in a bright color and some vintage style Edison bulbs. I've replaced every bulb in my house and on the porch…what a difference. Chicken pot pie looks delicious and I have an idea for those pinecones. Send me a box!! haha. I have a few that I got ten years ago for $1 each at Stew Leonard's. I just saw them at Terrain for $20 each!! I would love to fill my planters, but I can't find them here on the ground and Terrain is out of the question. Can we make a trade…what do I have even? Just kidding, sort of. Dreamy is the word that comes to mind here. Food and surroundings look fabulous, Mary Ann. You know I love this weather, and would love to live in the mountains. That looks like a dream vacation spot, and with the chicken pot pie, warm and cozy! Love your friends fabulous finds…that just makes me think I can't give up looking for treasures, even though I come up empty a lot of times! What a fun way to spend the fall, where you have a chance for snow. I love the snow, probably because I'm a native SoCal gal. Your cousin sounds like a trooper through such a challenge of having no lights for an extended period of time. It's so beautiful up there, it looks so crisp and clear. 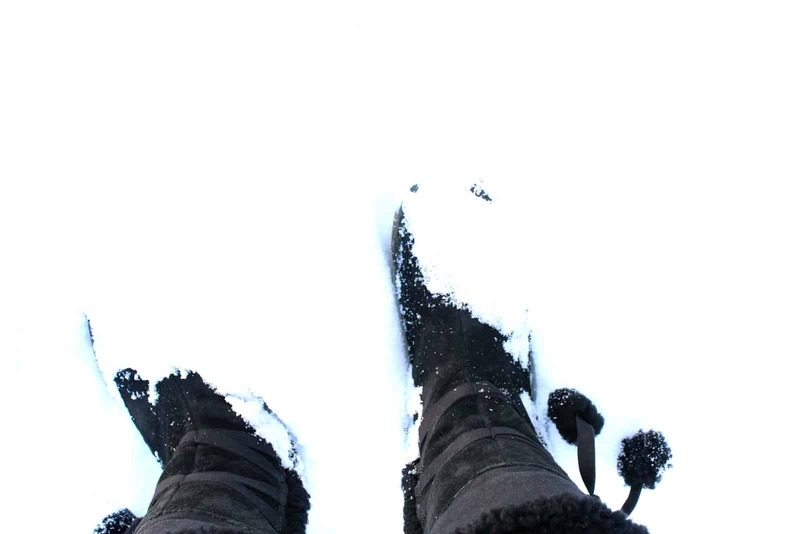 You certainly have the best of both worlds…..sand and snow!! And those pine cones are gorgeous! I have a good chicken pot pie recipe but think I might have to try yours. Seeing it makes my mouth water. I love to make it when the weather gets cold and it seemed like summer just didn't want to end, but I do feel a bit of fall in the air so will have to make it soon. Beautiful pictures! The snow looks lovely!!! I must cook that chicken pot pie. Looks scrumptious!!!! I'm so ready for a good CO snow storm, (feel guilty wishing for it). And, the chicken pot pie dinner would be the perfect compliment…yum! What fun pictures – makes me excited for skiing, and maybe even for chicken pot pie tonight! You are too cute posting about me, thank you!! Love this cozy post of yours. I love your gorgeous pine cones. One year I collected a boat load at Northstar and every Christmas I decorate our entire home with them. 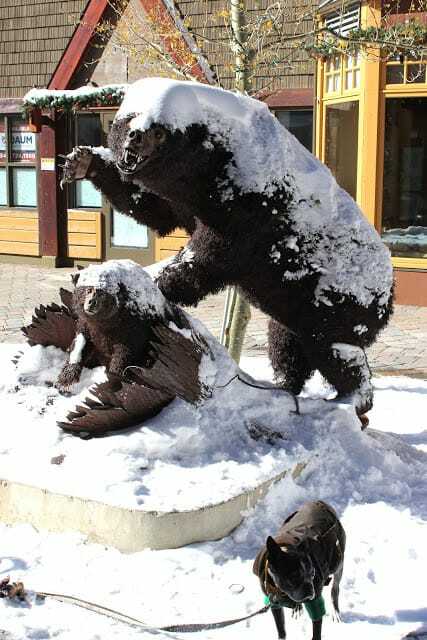 The iron sculpture scares me, I was in Yellowstone last summer when a couple was mulled by Grizzly , yikes! What a gorgeous setting and I'm totally going to make that pot pie…with a side of parsley of course! 🙂 Love those awesome finds too! I found your blog at It's Overflowing. Your home is absolutely gorgeous! 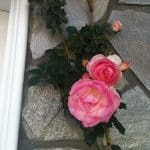 Your transformation of your cottage is amazing!